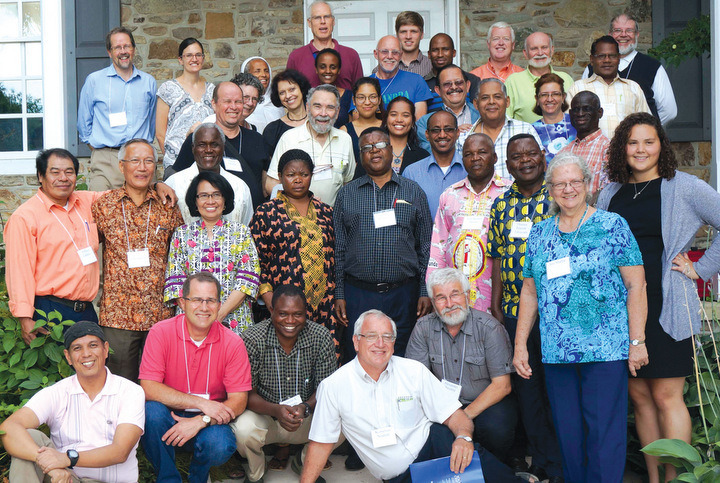 In late July, Mennonite and Brethren in Christ leaders from around the world gathered at Elizabethtown College in central Pennsylvania to celebrate the completion of a multi-year research project — a study of 24 Anabaptist groups from around the globe. The two-year project — a joint initiative of Mennonite World Conference and the Institute for the Study of Global Anabaptism at Go­shen (Ind.) College — profiled the demographics, beliefs and practices of 24 church conferences in MWC. A consultation hosted July 26-30 by the Young Center for Anabaptist and Pietist Studies at Elizabethtown (Pa.) College celebrated the survey’s conclusion. . . .
At the consultation, research associates . . . and church leaders from 21 MWC member churches in 18 countries analyzed the data and shared stories that gave context to the numbers. The consultation was the culmination of two years of data collection led by institute director John D. Roth and Elizabethtown professor of sociology Conrad Kanagy. In 2013, the same group had met at Goshen to determine the final content of the survey, structured around MWC’s “Shared Convictions,” and to receive training in methods of survey implementation. The survey was then translated into 26 languages. “I’m not aware of any other church fellowship that has done this work,” Kanagy said. Funded and directed by the institute, the profile is the first systematic attempt to gather quantitative data about Anabaptist groups affiliated with MWC, whose membership has more than tripled in the past three decades. Despite this rapid growth, there have been few scholarly attempts to understand these groups. Four Brethren in Christ groups took part in the survey — the Brethren in Christ in the U.S., Canada, Malawi, and Zimbabwe. A forthcoming article in Brethren in Christ History and Life will highlight the findings of the Brethren in Christ U.S. study. Look for the article in a future issue of the journal.